The principal navies could not avoid taking a lead in modernization after Hampton Roads and Lissa. The majority of warships in commission were out of date and virtually defenceless against any minor naval power which equipped itself with a mere handful of modern warships. Now that steam propulsion of screw-driven ships was established, sails could be abolished and full attention paid to improving power plant. 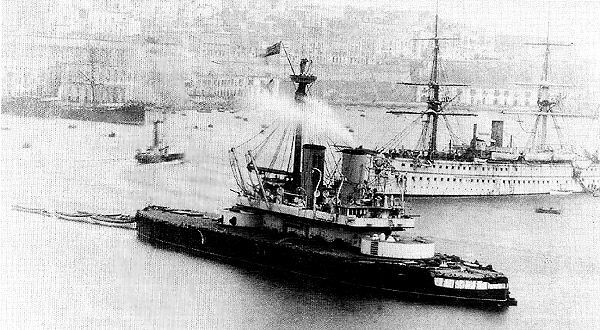 HMS Devastation, the first battleship without sails, was launched in 1871 but like all those to follow, she also incorporated the latest gunnery system. Notice had been given that henceforward priority would be paid to ways and means of destruction versus means of protection. In fact, there were two separate but coincidental lines of approach in naval thinking: attack by guns upon hull and superstructure, rivalled by underwater attack by mines and the locomotive torpedo. As cheaper steel became available in vast quantities and demonstrated superior qualities over iron, nearly all guns were made from it. Simultaneously, the earlier system of `hooped’ barrels was superseded by a method of steel wire wound over the inner tube. And any controversy over the attributes of muzzle or breech loaders was finally resolved in the 1870s by the need to solve problems inherent in loading and firing pieces which grew steadily in weight and length. A British- built 17 3/4-in calibre gun weighing 100 tons and firing a 2000 lb shell was in service by 1876, while pieces of 40 feet long were already in existence. Lengths were bound to increase, as this proved the best way to augment muzzle velocity in order to pierce thick armour. The business of manoeuvring a long gun inboard, off-target, in order to push charge and shell into its muzzle was both laborious, complicated and time-consuming. Rates of fire for breech loaders could be twice as great. Their most notorious defect, when first produced in quantity by Krupps and Armstrongs, was a susceptibility to bursting cases or emission of gas and flame due to inadequate sealing between breech and chamber. But by the time of the Franco-German war these faults had largely been eliminated. Controversy attended the development of the turret, also due to the problems of loading longer guns, but this was overcome once muzzle-loaders were finally done away with. 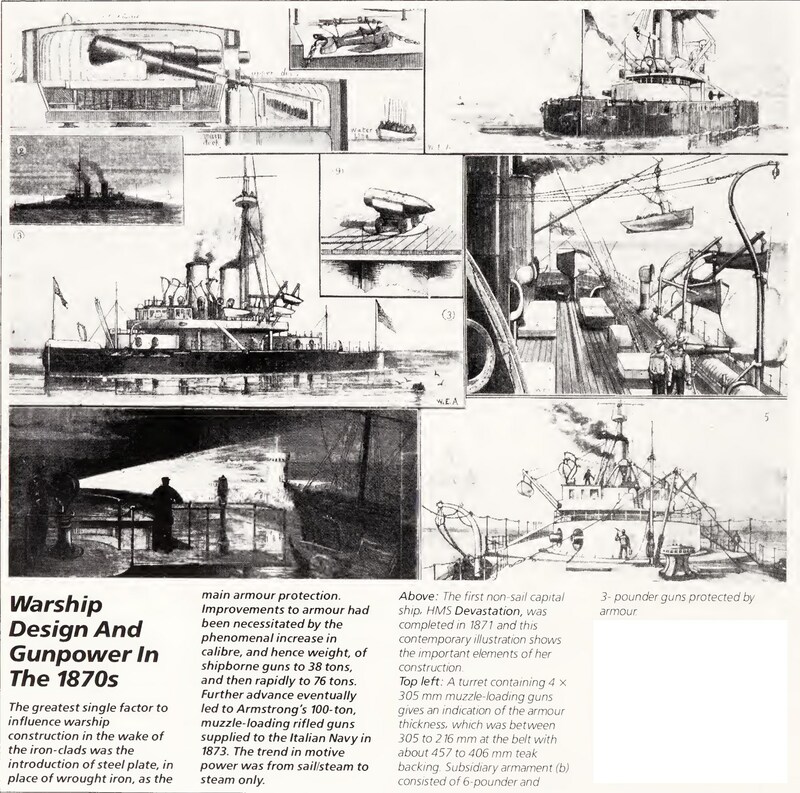 From the 1880s onwards, the turret became the almost universal, self-contained housing for a ship’s main armament, its ammunition supply brought up by hoist from magazines located below. Loading and traversing were powered by hydraulics (or later by electricity); and recoil was no longer taken up by friction devices or rope restrainers, but absorbed by steel spring and hydraulic systems (first suggested by the Siemens brothers in England in 1862) which returned the barrel to rest in its firing position and dispensed with the need to reposition guns after every discharge. In parallel with the intensive work devoted to guns and turrets went development of new shot and shells to defeat the thicker armour protecting their targets. Solid iron shot failed as an armour penetrator because it broke up too easily on impact. It was superseded by steel shot with a hardened tip, later improved by the addition of a soft steel cap over the nose to take the first shock of impact. Quite as much research and trial went, of course, into improvements to the armour these missiles were intended to smash or penetrate. Naturally, under trial, steel proved superior to iron. When one of the 2000-lb shells from a 17 3/4-in gun struck iron armour backed by 29 ins of wood at 1470 ft per second, it penetrated; against steel, however, it pierced only 21 ins deep. More efficient guns depended to a large extent upon improved propellants. The start made by Rodman in the 1850s was steadily built upon by others from many nations. In 1846 CF Schonbein, a German, had created guncotton (nitrocellulose) by adding nitric acid to cotton; subsequently improved by the Austrian Baron von Lenk in the 1860s, it was stabilized in colloid form by Paul Vieille and adopted by the French Army as Poudre B in 1885. This was four times more powerful than existing explosives. Then, in 1875, the Swede Alfred Nobel successfully mixed guncotton with nitroglycerine and in 1885 went a stage further by developing this mixture into ballistite, which was smokeless — a vital advance. Also about this time, Frederick Abel and James Dewar (both British) discovered cordite by mixing nitro¬ cellulose and nitroglycerine with mineral jelly. These smokeless propellants not only increased the effective range of artillery and led to a new generation of guns and small arms, they opened a new era in shooting techniques and tactics since the gun position would henceforward not be clouded in smoke (as an advertisement of its position) and the gunners would be free of smoke obscuration, enabling them to observe the fall of shot and make positive corrections to aim. In parallel, significant hardening and strengthening of steel came from the addition of special elements, such as tungsten, nickel, chromium and manganese. Greatest among the metallurgists researching alloy steels was the Briton Robert Hadfield, who invented manganese steel in 1882 and silicon steel in 1885 – the former of immense importance for armour and shot; the latter of great use in the burgeoning electrical industry. Simultaneously, M Marbeau of France invented nickel steel, soon used in America for ships’ armour plate. Alloy steels were more expensive than plain carbon steel, but their application by armed forces on sea and land, quite apart from civilian usage, was fundamental and implemented with astonishing rapidity. It was another step forward when in 1876 France launched the Redoubtable, the first ship built of carbon steel frames and armour and incorporating a watertight double-bottom and internal subdivision for damage control. It was even more important when, in 1891, the US Navy opted to armour its ships with nickel steel, which did away with the need to back wrought iron or carbon steel with timber. 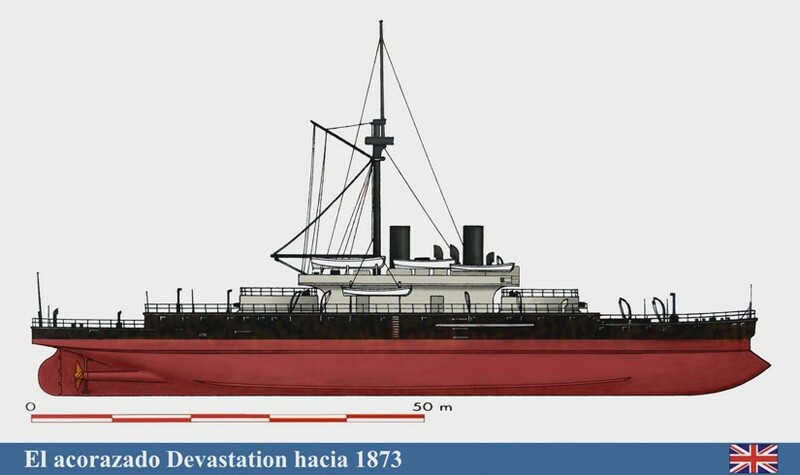 Attack below the waterline by static mines as a defensive measure had sunk 26 ships during the American Civil War. 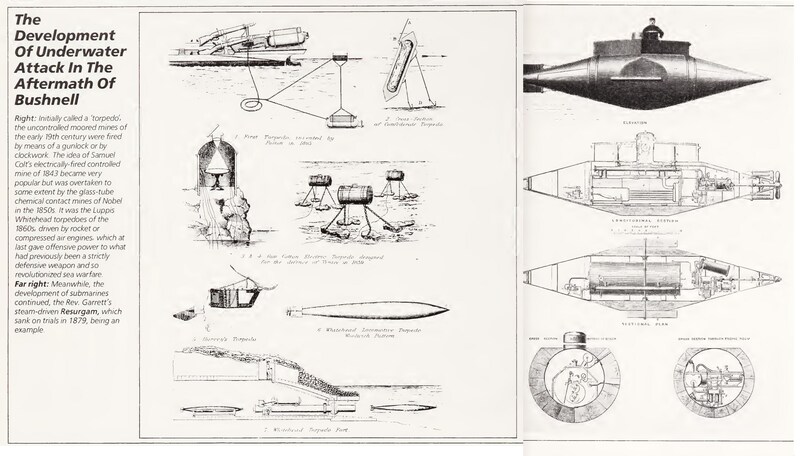 Offensive underwater operations might have occurred had the US Navy adopted the rocket-propelled torpedo of Pascal Plant, but when his model was tried out before President Lincoln in December 1862, it ran wild and sank a luckless schooner which happened to get in the way. 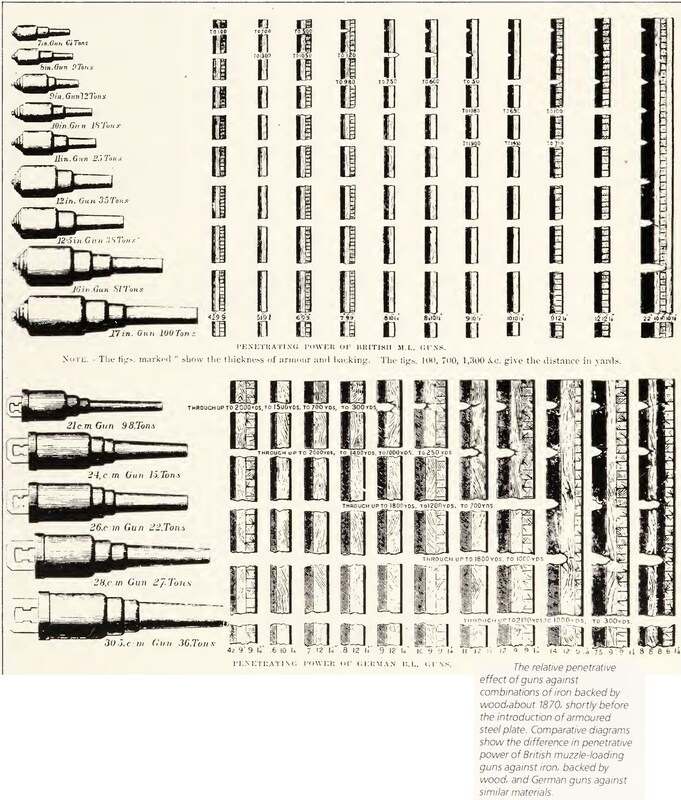 It was collaboration between Giovanni Luppis of Austria and Robert Whitehead of Britain which, in 1864, produced the first practical locomotive torpedo. Luppis demonstrated (as Bushnell and Fulton had shown 90 years previously) that when a gunpowder charge was exploded underwater, the water had a tamping effect. Whitehead put on sale in 1866 a 14-ft, cigar-shaped torpedo, 14 ins in diameter with an 18-lb charge in the nose. It was powered by a compressed air engine driving a propeller, had a speed of 6 knots and a range up to 700 yards. When launched, initially from under¬ water tubes, but later from tubes carried above water, it ran a set course, controlled in depth by a hydrostatic valve and a pendulum weight working together to activate a pair of horizontal rudders called hydroplanes. Rudimentary as the Whitehead torpedo was in the 1860s, its impact upon naval thinking and ship construction was immediate and positive. While investigations to improve the existing model went on, foresighted officers began to study changes in tactics which this weapon would impose upon fleet commanders and ships’ captains. Among many innovations came the idea of a new class of warship to specialize in attacking with torpedoes. By 1876 the British had built a 33-knot, 19-ton coastal torpedo boat called , HMS Lightning. Eight years later the Russians had in service 115 sea-going, 40-ton torpedo boats with a speed of 22 knots. Although many old-guard admirals might disapprove of torpedoes, the advent of the torpedo boat could not be ignored. Henceforward battleships would require better protection below the waterline and more watertight compartments, plus extra defensive armament in the shape of quick-firing, breech-loading guns. Escorts, or so-called torpedo boat destroyers, were also called for to supplement firepower. 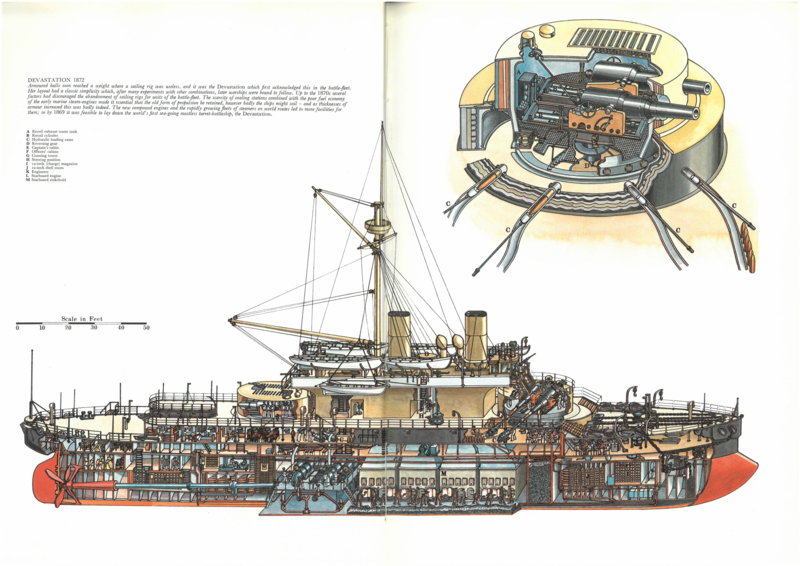 In 1881, the Royal Navy finally abandoned slower firing muzzle-loading guns and three years later was compelled to take note of a British-built, 386-ton destroyer called Destructor, fitted with a triple-expansion engine (the first ship to be powered with this invention by a Frenchman, Benjamin Normand) and with a speed of 22 1/2 knots. The inescapable outcome of threatening firepower and underwater attack was a race between nations to maintain parity. No nation which looked to the sea for its trade and security could afford to permit rivals a decisive technical superiority. Inevitably increases in weight, power and complexity of arms were called for, together with a considerable rise in costs and a demand for specialists to build and run the machinery and then control the weapons. A wooden ship of the line in 1850 weighed around 3000 tons, mounted some 100 guns up to 10 ins in calibre (with a range of 400 yards) and had its speed controlled by the wind. By the 1890s a steel battleship could weigh 13 000 tons, carry a mere four or six powerful guns of about 14 ins in calibre, with a 10-mile range at a speed of 18 knots. The overhead costs and logistics of replacing every old ship with types of a totally different kind were enormous. Building and manufacturing called for new industries and the recruitment and training of technicians and labour for unfamiliar tasks, while acquiring new traditions of quality production. So rapid was progress that, in unprecedentedly short periods, equipment was made obsolete by more inventions coming to hand. Warships had recently remained combat-worthy for half a century and more. Now they could qualify for replacement within a decade. Doing away with sail not only placed demands upon engine designers and manufacturers, but also had repercussions in other fields. The rope and sail-making industries were faced with severe cut-backs in production which in turn caused a reduction in the growing and milling of flax and hemp, thus generating problems for farmers. Calls for higher speeds and greater radius of action drove marine engine designers to improve the efficiency of steam engines and forced ship designers to provide far more space for the bunkering of coal. Nations like Britain and France, with world-wide commitments of empire and trade, were compelled to establish coaling bases at strategic points, such as the Falkland Islands, in order to maintain the mobility of their ships. No longer could a fleet be victualled for a year’s voyage: movements beyond the range of home ports had to be carefully arranged within a new logistic system, requiring time to assemble, good communications and practice. This entry was posted in Warship, Weapons by MSW. Bookmark the permalink.